The market segmentation, targeting and positioning (STP) process is a fundamental concept in understanding marketing and the strategies of firms. In most marketing textbooks, the STP approach is presented as a simple three step process. While that approach provides a good introduction to this marketing concept, it fails to adequately highlight the smaller steps of the STP process that should also be understood. 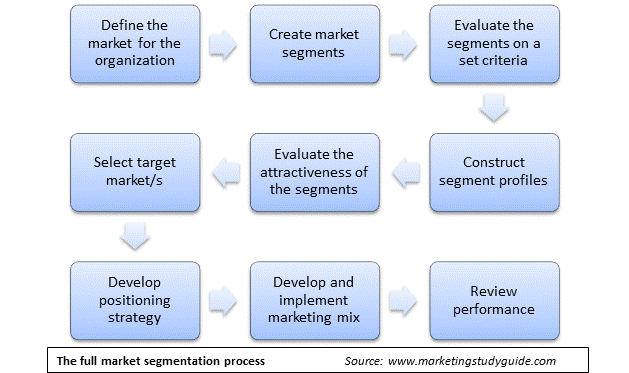 The following is a quick discussion of the full market segmentation, targeting and positioning (STP) process, as shown above. In the first step in this more detailed model is to clearly define the market that the firm is interested in. This may sound relatively straightforward but it is an important consideration. For example, when Coca-Cola looks at market segmentation they would be unlikely to look at the beverage market overall. Instead they would look at what is known as a sub-market (a more product-market definition). A possible market definition that Coca-Cola could use might be diet cola soft drinks in South America. It is this more precise market definition that is segmented, not the overall beverage market, as it is far too generic and has too many diverse market segments. Once the market has been defined, the next step is to segment the market, using a variety of different segmentation bases/variables in order to construct groups of consumer. In other words, allocate the consumers in the defined market to similar groups (based on market needs, behavior or other characteristics). After market segments have been developed they are then evaluated using a set criteria to ensure that they are useable and logical. This requires the segments to be assessed against a checklist of factors, such as: are the segments reachable, do they have different groups of needs, are they large enough, and so on. Once viable market segments have been determined, segment profiles are then developed. Segment profiles are detailed descriptions of the consumers in the segments – describing their needs, behaviors, preferences, demographics, shopping styles, and so on. Often a segment is given a descriptive nickname by the organization. This is much in the same way that the age cohorts of Baby Boomers, Generation X and Generation Y have a name. Available market data and consumer research findings are then are added to the description of the segments (the profiles), such as segment size, growth rates, price sensitivity, brand loyalty, and so on. Using this combined information, the firm will then evaluate each market segment on its overall attractiveness. Some form of scoring model will probably be used for this task, resulting in numerical and qualitative scores for each market segment. With detailed information on each of the segments now available, the firm then decides which ones are the most appropriate ones to be selected as target markets. There are many factors to consider when choosing a target market. These factors include: firms strategy, the attractiveness of the segment, the competitive rivalry of the segment, the firm’s ability to successfully compete and so on. The next step is to work out how to best compete in the selected target market. Firms need to identify how to position their products/brands in the target market. As it is likely that there are already competitive offerings in the market, the firm needs to work out how they can win market share from established players. Typically this is achieved by being perceived by consumers as being different, unique, superior, or as providing greater value. Once a positioning strategy has been developed, the firm moves to implementation. This is the development of a marketing mix that will support the positioning in the marketplace. This requires suitable products need to be designed and developed, at a suitable price, with suitable distribution channels, and an effective promotional program. After a period of time, and on a regular basis, the firm needs to revisit the performance of various products and may review their segmentation process in order to reassess their view of the market and to look for new opportunities.